As this post begins, I am waiting for my husband to join me at Jenkins Restaurant and Deli in Athens, Tennessee. It's a comfortably casual kind of place. They serve American food, burgers, steaks and a wonderful chicken salad. Jenkins Restaurant is a local eatery that's packed with the all the character of a family owned Southern diner. You can find them at 411 S. Jackson St, 37303. Even the walls pay homage to Tennessee Wesleyan College here in Athens and old movie posters. A few of the eclectic touches include a neon sign on the wall that advertises beer (even though the bar is on the other side of the restaurant). The walls are lined with black and white photos and there's even an old poster from the Barnum and Bailey Circus! These details are part of what makes visiting fun. The peppy servers (many of whom are college students) add to the atmosphere. My favorite spot in Jenkins Restaurant and Deli in Athens, is in the room that's to the right as you walk in. This is away from the kitchen and can be a touch cooler than the other side and away from the big screen TV in the bar. Please note, I have nothing against the TV or the bar. It's just that I like quiet corners where the noises of the day can fade away for awhile. Plus, the model of the Budweiser beer wagon and Clydesdale horses is pretty interesting. Just look behind you and over the door frame after you enter the room. The prices at Jenkins Restaurant and Deli in Athens are pretty reasonable. Appetizers range from $4.99 for fried pickles to $7.49 for loaded potato skins. Their renowned chicken salad is on the appetizer menu along with nachos. I decided to order the potato skins while waiting. Hubby arrived about a minute before the appetizer hit the table. Even he was surprised at the size. The platter arrived with about 8 large points of potato. It was completely covered in a generous load of melted cheese, piles of real bacon chunks and an ice cream sized dollop of sour cream. It could be a meal by itself! All it needed to make it really scrumptious was a few grains of salt. Jenkin's in Athens, TN is open for dinner but I've only been able to fit lunch into my schedule. The dinner menu includes everything from shrimp to steak. All of the items sound delicious. Jenkins has an outdoor patio which promises to be fun for a romantic evening out. Today, we only ordered sandwiches but are very pleased with the size and flavor. My ham and cheese is on a steaming 8" hoagie roll with a huge pile of homemade kettle chips. The fresh leaf lettuce was warmed by the sandwich but still had a good flavor. Hubby ordered the ruben and was very pleased. It comes on two large slices of rye. I'm going to estimate that each was about the length of his hand. Alongside the sandwich was an equally huge pile of kettle chips. All the starches were a little much. Fortunately, Jenkins in Athens, Tennessee has no problem with providing takeout boxes. We washed it all down with two glasses of unsweetened tea. The server even brought to-go cups for the iced tea. That's always a tip increasing touch. In fact, our pre-tip bill with tax was $28.83. Not bad for a sit down restaurant, drinks, appetizer and entrees. 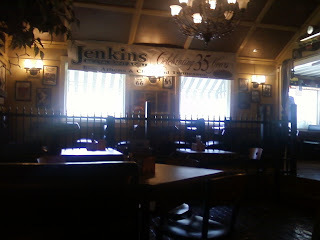 Jenkin's also has a restaurant in Cleveland, Tennessee. National Geographic mentioned it in an article they did about the 1996 Olympics on the Ocoee River. Apparently even the writer was impressed by the chicken salad. Although I could not find the article from National Geographic online I did find a reference to it on the site of the Chattanooga Times Free Press. There are some great photos on the Facebook page of Jenkins Restaurant and Deli. They recently celebrated their 35th year in business. From the looks of things, they will be around for at least another 35 years or more.